Unique to Quebec, the High Rise Challenge is a physical challenge that sees participants raise funds for Muscular Dystrophy Canada. 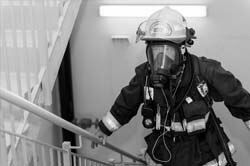 The event was established in 1997 by a Montreal firefighter, Denis Harel, who climbed the stairs of 30 buildings in downtown Montreal. In 1998, he passed the torch to Yan Lefebvre, a Pointe-Claire firefighter, whose performance was certified in the Guinness Book of Records. Since then, the challenge has been met by firefighters from over 250 different fire departments across Quebec. 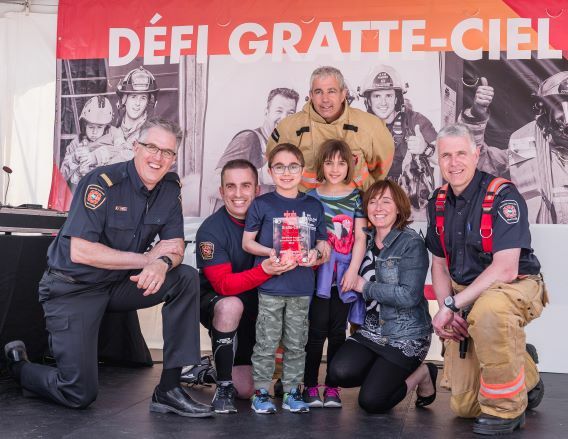 The 22nd edition will take place on Saturday, June 1, 2019 and more than 600 firefighters, paramedics, police officers and members of the public will face their challenge: climb 23 floors of the Deloitte Tower – twice - for a total of 1188 steps. A tough challenge for all these heroes, whether in uniform or not! Take the challenge, have fun, be a hero! Take on this thrilling challenge! Exercise the power of your muscles and of your heart to raise funds for people suffering from neuromuscular diseases. Take part in the 22nd edition of the Montreal High Rise Challenge and help us help them keep their muscles moving. See you at the top! Have fun and do good! Attention: Participants looking to beat last year’s record – You’ll receive a chip bracelet to track your climbing time! 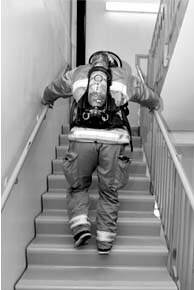 You can complete your challenge dressed in full combat clothing and gear equipped with your self-contained breathing apparatus (SCBA). T-shirts will be handed out and lunch will be served. Raise funds : each team member must raise a minimum of $100. You will receive the tools and resources needed to help you achieve your goal, and more! This challenge has been created to honour Frédérick Dugay, an inspiring and courageous young man with muscular dystrophy who passed away at a much too young age. 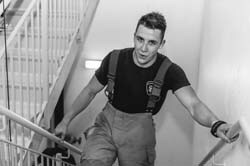 This challenge is for high-speed enthusiasts who will have to climb the 46 floors in a limited amount of time, dressed in full combat clothing and gear equipped with a self-contained breathing apparatus (SCBA). Raise funds : each team member must raise a minimum of $480 and you receive the tools and resources needed to help you achieve your goal, and more. The participant to beat is Stevens Paquet, a 16-year-old son of a firefighter from Portneuf, winner of the 2018 edition. Congratulations Stevens! NOT for the faint of heart! This challenge is for lovers of outstanding sports achievements. wear your self-contained breathing apparatus (SCBAs) as well. Raise funds : each team member must raise a minimum of $750 and you receive the tools and resources needed to help you achieve your goal, and more. Only 100 people may participate in the extreme challenge and only those registered for the extreme challenge may climb to the top more than once. Sign up before it’s too late! The team that raises the most funds will be awarded the 22nd Edition Trophy. Additional information will follow by email. The winning team in 2018!